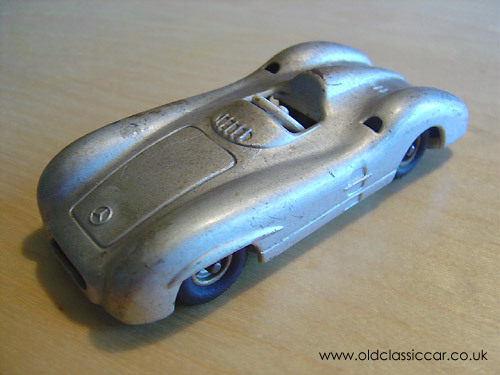 This I think is modelled around the enclosed version of Mercedes' W196 Grand Prix racing car from the mid fifties. The enclosed 196 was an experiment in aerodynamics but didn't meet with huge enthusiasm from its drivers, Messrs Moss and Fangio. Positioning the car in the corners was reputedly not easy with such overhangs either end of the car, and this bodywork was only seen at a few races, notably Silverstone and Reims in France. This toy has the maker's name on the base (also tinplate) - CKO - and was Made in Western Germany. The friction drive isn't too clever and could do with looking at, otherwise this old toy is in pretty good condition.